When you need car repair, it’s easy to be taken advantage of, especially if you don’t know a lot about cars. One of the most effective weapons against this is a detailed written car repair estimate. It’s one of the best ways to get the best price. If you would like to be able to bargain for a lower price, you should get several written estimates from several different Arizona car repair shops. Then check these estimates online, as there are numerous free car repair estimate calculating tools which can give you an idea of what the repairs are going for in your area, so you’ll know if these estimates are at least in the ballpark. What should an Arizona car repair shop estimate include? The estimate should include a breakdown of all the costs that will be incurred during your Scottsdale car repair. The two biggest items on there will be parts and labor. The estimate will usually begin with a section containing your personal information, your vehicles information including the year, make and model as well as how many miles are on it. It should also include a description of the problems you are having and the requested repairs. The parts to be used should be listed individually along with the quantity and the price of each. Ask them to specify the type of parts to be used. The best choice is new OEM (original equipment manufacturer) parts. If you are offered aftermarket parts in order to keep the price down, you may want to research the brand before making a decision, as aftermarket parts can run the gamut from good quality to bad. The quality of American made parts may be higher than those from China or other countries with less stringent standards. Refurbished, remanufactured or rebuilt parts, if done properly can be similar in quality to OEM parts. If they are going to be using salvage (used) parts be absolutely certain you have in writing what type of warranty these parts come with and decide if the discounted price is worth knowing that these parts can’t last as long as new. Armed with the list of parts needed for your car repair you can check online for the prices these parts are selling for in your area. One of the ways car repair shops have been known to pad the bill is by overcharging for parts. While on the subject of parts, always request to have your old parts returned to you. Do this before any repair is begun otherwise if you ask as an afterthought they may already have been disposed of. The cost of labor is the other main component of a car repair estimate. Car repair shops often have a computer program that can give a rough estimate of the number of hours involved in the repairs your car requires. Most shops don’t advertise their labor rate but it’s extremely important that you have this information in writing before you authorize any car repair, otherwise they can charge you pretty much anything they want to. If you don’t understand the labor description don’t be afraid to ask questions. The labor estimate should include removing the old parts and installing the new parts. Car repair shops usually charge a flat fee for disposing of oil, tires and hazardous material. If they want to charge a flat fee for supplies such as shop rags and cleaning supplies, you should ask that they be itemized instead, since many of the supplies may not be used while repairing your car. Taxes constitute a hefty piece of your bill, so be sure to have this included in your estimate. The summary of charges is the grand total of parts, labor, fees, miscellaneous charges and taxes. Check the calculations and question any discrepancies before authorizing any repairs. No unauthorized charges should be on your final bill. 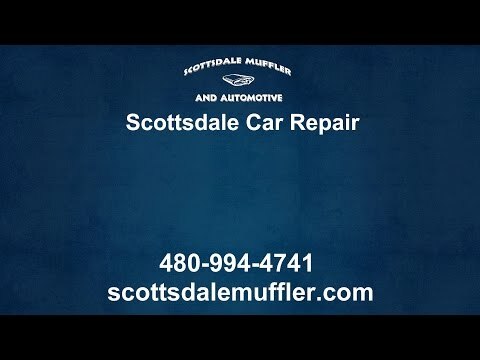 At Scottsdale Muffler & Automotive we have spent decades building a reputation of honesty and integrity. That’s why our clientele consists of so many repeat customers and our new customers usually come in because they have heard good things about us. We will gladly explain any car repairs that need to be done. We provide our customers high quality work at honest, competitive prices.